A public meeting will be held on May 31st, 2018 at 4:00 p.m. in the Lancaster County Redevelopment Authority Office, 28 Penn Square, Suite 200, Lancaster, PA, 17603. The meeting will be held to provide the general public with an opportunity to review and comment on the proposed Fiscal Year 2018 Annual Action Plan for the County of Lancaster (County). The public comment period for this Plan begins with this notice and ends prior to the County Commissioners meeting scheduled for June 19th, 2018. The Annual Action Plan presents the objectives to be achieved and the activities to be undertaken in fiscal year 2018 for the County using HUD funds through the Community Development Block Grant, HOME Investment Partnerships Program, and the Emergency Solutions Grant. The anticipated resources also include program income and reprogrammed funds from prior year’s funding. The total anticipated resources for the County is $5,780,960. The proposed 2018 Annual Action Plan for the County can be viewed at the offices of the Redevelopment Authority. 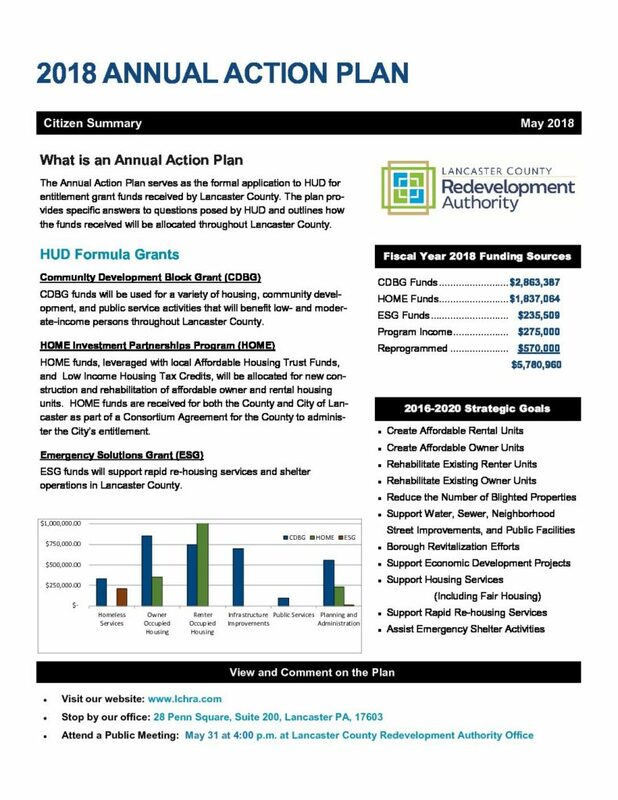 Additional copies of the draft Plans will be made available to the Community Action Program of Lancaster County, Spanish American Civic Association, Lancaster County Board of Commissioners, Lancaster County Planning Commission, the City of Lancaster, and the Lancaster County Library. If you need language assistance, or you are a person with a disability who wishes to attend the public meeting and you require an auxiliary aid, service, or other accommodation to enable you to participate in the meeting, please contact the Justin Eby at (717) 394-0793 x225 or jeby@lchra.com, at least two days beforehand, to discuss how we may best accommodate your needs.